For decades it has been well known throughout the hydrocarbon community that natural gas is plentiful. The task of extraction has been cost-prohibitive for many companies until new safety and technological related advances were made through joint public private entity partnerships. With fracking and horizontal drilling as the main extraction processes of natural gas, mobility has been a key driver for energy companies as they install gas monitoring stations throughout the country. 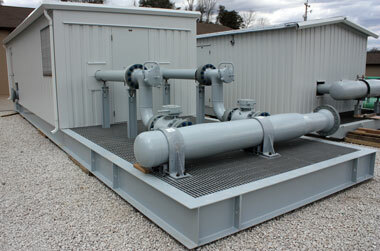 A full service turnkey engineering, manufacturing, and construction contractor for the natural gas industry located in the Appalachian Basin worked with GEF Inc. to broaden applications with FRP composites for the gas transmission, production, distribution, and gas storage companies within the U.S.
One such application has been the manufacturing of skid mounted natural gas monitoring stations. The stations are shipped throughout the country and typically measure 12' in width and 25' in length. Each platform is outfitted with DURAGRID® I-6000 pultruded fiberglass grating measuring 1-½" in thickness, with a gritted top. The answer was threefold when they were asked why they transitioned from steel to FRP for their platforms. Due to shipping costs and mobility concerns, DURAGRID® reduced the overall weight of each skid making it easier to ship as well as move around for fabrication and site use. 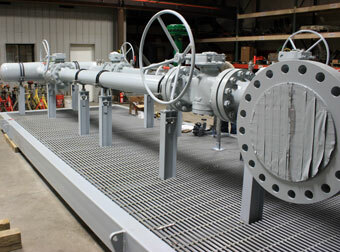 With multiple years of servicing the natural gas industry, the turnkey natural gas contractor quickly realized that corrosion was becoming an overwhelming issue at these extraction sites due to environmental exposure. Steel was rusting too quickly, demanding safety and maintenance downtimes. As an added benefit of FRP being nonconductive, an operational environment which is non-sparking added greater fire safety value for these monitoring stations.